Italy in the early modern period was one of the wealthiest areas of Europe. Italy had a very advanced and sophisticated culture. Many Italians were appalled by the corruption of the Church and there had been several movements that challenged the supremacy of the Papacy in Italy since the early middle ages. However, despite these factors, the Reformation did not have any lasting impact on Italy. Indeed, there was only a very brief Italian Reformation and by 1600 Protestantism was effectively extinct in Italy. Catholicism was actually strengthened by the failed Italian Reformation. Protestantism failed to establish itself on the Peninsula for three reasons: the enormous political power of the Catholic Church, the states’ support for the Counter-Reformation and the Inquisition, and the popular attachment to Catholicism. It has been widely stated that Italian society in the Renaissance was largely secular. This has been challenged by Burckhardt among others. The elite was largely secular and the humanist class of scholars was more interested in the classics than the bible. However, the majority of the country was religious. Italians went to mass and took part in religious festivals. The morals and the beliefs of the population were very much influenced by the Catholic Church. This is remarkable given the corruption and the decadence of the Papacy. The Pope was a powerful secular ruler and controlled much of central Italy. They often appeared to be more interested in their secular power than their role as the Head of the Church. Julius II was more interested in wars than religion. Then there was the corruption of the Popes, best illustrated in the reign of Pope Alexander IV. Many Italians, such as Machiavelli had long been disenchanted with the Papacy and blamed it for the divisions in Italy and for the various invasions since 1494. There was a long history in Italy of ‘heresy’. Many Italians especially, in the Northern Cities had joined groups that were not happy with the Catholic Church and had developed their own doctrines and practices. They had all being suppressed. In the 1490s, Girolamo Savonarola (1452–1498), a Friar launched a religious revival in Florence. This included the famous ‘Bonfire of the Vanities’. Savonarola was soon so influential that he was able to expel the de Medici and establish a theocracy in Florence. 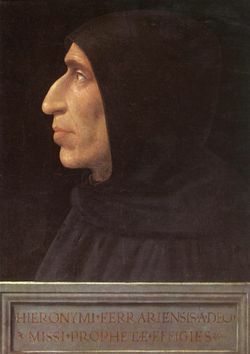 Later Savonarola was burned at the stake. In the early days of the Protestant Reformation, many expected that Italy would reject the Catholic Church. Yet this did not prove to be the case. In the 1520s, there were the first reports of Lutherans as they were known in Italy. They were influenced by the works of Luther and they were sympathetic to his aims. The all believed that the Church was in need of Reform and challenged the authority of the Pope. The individuals were all influenced by humanism and sought a more personal relationship with God, in order to secure salvation. Many of the early ‘Protestants’ at first did not seek to set up another church, rather they sought to reform the Church. When it became apparent that the Catholic Church was not willing to engage in meaningful reforms they increasingly sought separation from the Church. Some Italian humanists translated some of the works of Luther and they were transmitted in clandestine networks. There were soon small groups of Lutherans in many Northern Italian cities, especially in the North. A small group of intellectuals also was later discovered to be in Naples. The Reformation became more radical and many new groups emerged. These included the Calvinists and Anabaptists. The influence of these doctrines was mainly among the upper class. There were many communities of foreign traders in the Italian cities and especially in Venice. It seems that there was a large community of Anabaptists and Lutherans in Venice. Later a group who adhered to Nontrinitarians grew and gained a following among the educated. It appears that many foreign Protestants, especially French Huguenots fled to the cities of Italy to escape persecution at home. According to one Pope, groups of Protestants had been active in many areas of Italy. However, the influence of Protestantism was confined to small groups and not many common people outside urban areas accepted the movement or its doctrines. Indeed by 1600 there was no Protestant presence in Italy apart from some foreign mercenaries, diplomats and traders. The Catholic Church was actually stronger than in 1500. Many Italian Protestant had been forced into exile and they contributed greatly to the Reformation in Eastern Europe. One of the reasons for the failure of Protestantism to make any inroads in Italy was because of persecution by the Catholic Church, usually with the support of the local rulers. The Church in Italy was corrupt but it was also powerful. Since the early middle ages, the Inquisition had not been very active. 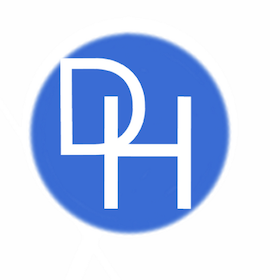 In general, the humanists had been able to hold many unorthodox views and opinions. The threat of Protestantism meant that the Inquisition was reformed and became much more active. The Inquisition was a series of institutions that were dedicated to ensuring religious conformity and the eradication of heretical beliefs. Soon the Inquisition was searching for Protestants and arresting them. Those who were suspected of holding views that were sympathetic to Protestantism were deemed to be heretics. They were placed often in special prisons, tortured and tried in Church courts. Protestants, if found guilty of heresy, could be sentenced to death. Many Protestants were executed in brutal ways. Bartolomeo Fonzio, who translated some Protestant tracts into Italian, was executed by drowning and more were burnt at the stake. 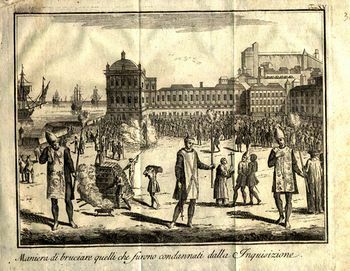 These executions all took place in public and the Italian population was left with little doubt about the dangers of even sympathizing with the Protestant cause. The Church in Italy was able to prevent the spread of Lutheran or other Protestant ideas unlike in Northern Europe. The Roman Catholic Hierarchy was able to suppress the teachings and the writings of the reformers. There was no discussion of the ideas of Luther or Calvin in the Universities of Italy. The Church was able to introduce a system of censorship that prevented Protestant literature and writings from reaching many Italians. The also operated an elaborate surveillance system: agents of the church would check people’s letters and ensured that the printing presses only produce works that conformed to Catholic teaching. Preaching was very important in the spread of Reformation but this was impossible in Italy. Any Italian or foreign Protestant who preached in Italy was liable to be arrested by the Inquisition. Italy was divided politically but the peoples of Italy had a distinct sense of being part of an Italian society and culture. They resented any foreign interference in their country. In the 16th century, many Italians hated the fact that their country had been turned into a battleground mainly by foreign armies. The fact that Protestantism was something foreign and alien meant that the Italians population from all levels of society rejected it. They saw it as something that was un-Italian. It has been often stated that many Italians rejected Protestantism because of the Sack of Rome in 1527. The Imperial Army after defeating a French army mutinied and many of the soldiers were German Lutherans. They besieged Rome and later captured it and for several months occupied it and committed many atrocities. The Lutheran soldiers openly mocked the Papacy and the sacraments of the Catholic Church. The Sack of Rome shocked Italy and for many Italians, they associated Protestantism with terror and atrocities. Many Italians, while unhappy with the Papacy and the institutions of the Church, remained devoted to their own brand of Catholicism. In Italy, there had developed many variations of Catholicism, based on the worship of local saints and festivals. Local religion in Italy was often a mixture of Christianity and remnants of paganism. Many Italians were very much attached to their local variant of Catholicism and they had little time for the austere beliefs of Protestantism. Many ordinary Italians believed that the local rituals and rites catered to their spiritual needs. It is widely held that Protestantism was reliant on the support of the nobility and monarchs for its success in Northern Europe. In Germany, Scandinavia, and England the elite largely supported the Reformation. Without the support of the elite, the Reformation would have more than likely have failed. 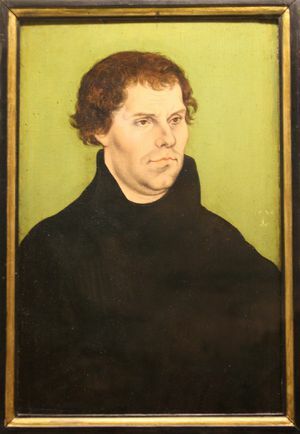 Luther was reliant on the support of the Duke of Saxony and other nobles. Calvin was dependent on the urban patriarchs in Geneva for his Reformation. In Italy, the local Protestants did not have the support of the elite. Much of the Peninsula was dominated by the Spanish Monarch, especially the south of Italy. They were intolerant of any sign of Protestantism and they were enthusiastic supporters of the Inquisition. Any Protestants apprehended on Spanish controlled territory was likely to be handed over to the Inquisition. The Spanish helped the Inquisition to destroy a small group of Protestants associated with the University of Naples. The various rulers of the city-states in Italy co-operated with the Inquisition partly out of respect for the power of Spain and also out of a genuine dislike of Protestantism. The local elites like the common people saw it as a ‘foreign creed’ and did not belong in Italy. There was some support for Protestants in Ferrara and the Republic of Venice was not willing to allow the inquisition to operate on its territories. The relative toleration that Protestants found in Ferrara and Venice was short-lived and Protestantism was unable to find any sympathetic government in Italy. After 1550, the Counter-Reformation, a movement that sought to reform the Church and counter the threat of Protestantism did much to end the appeal of Protestantism. The various governments supported the Counter-Reformation and this allowed the Catholic Church to grow strong. The clergy was better educated and more disciplined. The Catholic Hierarchy cracked down on many abuses, and tried to suppress any form of corruption such as simony. The Counter-Reformation, because of the support of the states in Italy was able to retain the loyalty of all classes of Italians. The Italian Reformation was a failure. Despite widespread contempt and disillusionment with the Papacy and the Church, the Reformation was only able to secure the allegiance of a few scattered number of intellectuals and upper-class Italians. Various states of Italy were bitterly anti-Protestant and refused to give any support to those who were sympathetic to the ideas and teachings of Calvin and Luther. Any Protestant who was in Italy in the sixteenth century ran the risk of persecution and even death. The Catholic Church was violently opposed to the Reformation and it permitted the inquisition to imprison and torture those who were even suspected of ‘heresy.’ An unknown number of Italian Protestants were executed on the orders of the Inquisition. Protestantism was also genuinely unpopular among many members of the elite and the ordinary people viewed it with suspicion because it was seen as a foreign creed. The Sack of Rome in 1527 shocked Italy and it reinforced among Italians the negative perceptions of the Reformation. Lutheranism was seen as barbaric and violent and the destruction of Rome confirmed that in their minds. Finally, despite the perceptions of widespread corruption, non-elites were happy with the form of Catholicism as practiced in their local community, which was often a mixture of paganism and Christianity and saw no reason to convert to a ‘foreign’ religion.